Trespass is the act of entering a space without permission, manipulating boundaries by either breaking through, shifting or avoiding them. The Trespass Project explores the most powerful and empathetic of human interactions – touch – and the complex aesthetic responses it produces in designed structures surrounding interacting performers, dancers and participating audiences. A seemingly unpredictable, ever transforming, interactive and stimulating environment, Trespass gives us the opportunity of becoming more conscientiously aware of ones own body. Once these unlimited possibilities of spatial experience are acknowledged, architecture can re-condition us to become over-stimulated in a semi-predictable manner. This we believe, in turn, reinvigorates the physical and visual relationship between architecture and its inhabitants. 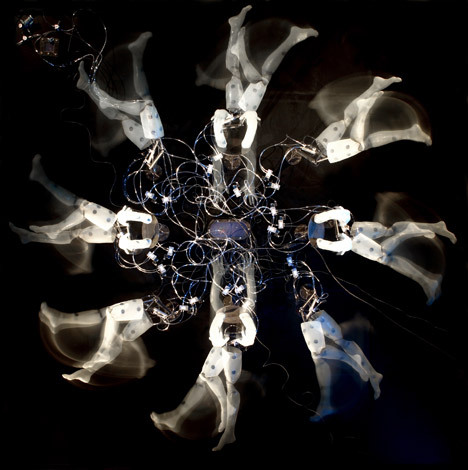 In July 2015 Trespass – a collaboration between the Interactive Architecture Lab, Shobana Jeyasingh and the Department of Informatics and the Cultural Institute at King’s College London – presented a live performance between a robot and dancers choreographed by Shobana Jeyasingh (full credits below). Following this event the Bartlett team has developed a second robot prototype for public interaction. 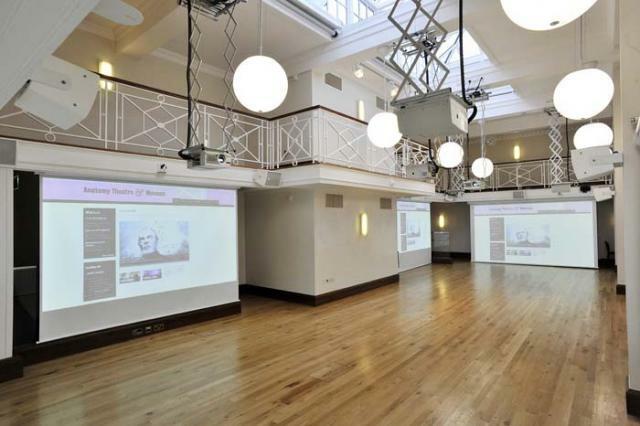 The image below shows the work installed at the Bartlett BPro Exhibition in September. A film is in development. Shobana’s work is inspired by the coexistence of different personal and historical territories within the make-up of one individual, referencing issues of migration such as: ideas of home; boundaries; territories; belonging; leave-taking and new beginnings. More of her work can be found here. Trespass as the name suggests, deals with ideas of breaking through boundaries. Achieving this would be possible with exploring methods of touch. 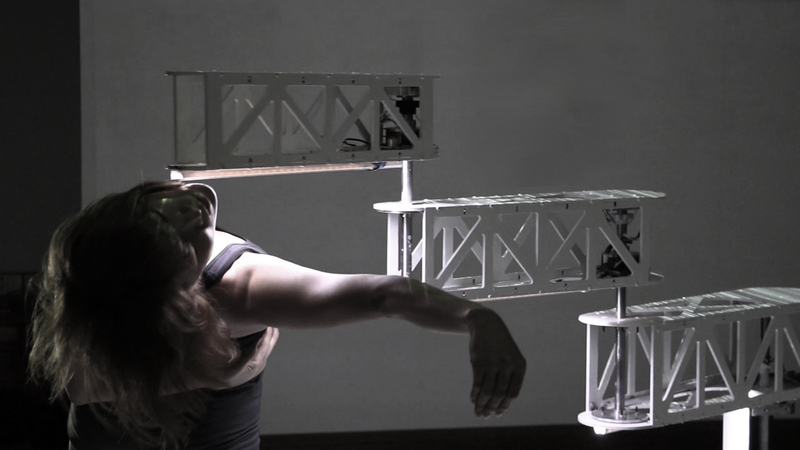 The modules will respond to the dancers touch, and will react based on the intensity of “push” or “pull”. Trespass intends to develop highly innovative artistic work that would see the most powerfully empathetic of human interactions – ‘touch’ – produce complex aesthetic responses in specially designed structures surrounding interacting performers, dancers and participating audiences. This site specific piece of work could suggest new ways of understanding our own behaviours, whether in performance or in everyday human interaction. The piece is to be performed in the Anatomy Museum at King’s College. The site consists of a mezzanine level that wraps around three sides of the space with a stairway leading to it at both ends. This condition at the site prompted the decision that the audience will view the piece from this level, ostensibly looking down onto the performance. 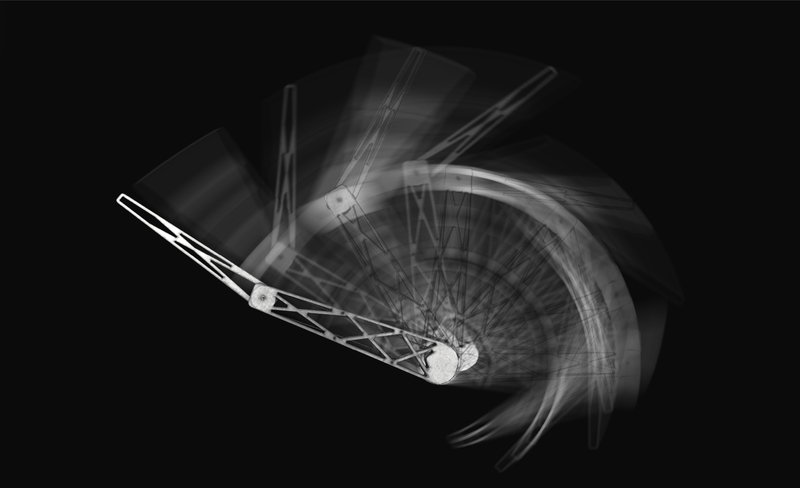 This is an interesting situation where we quickly realised that movement particularly in the X-Y plane would be most impactful, unless of course the movement in the Z axis was extremely drastic. 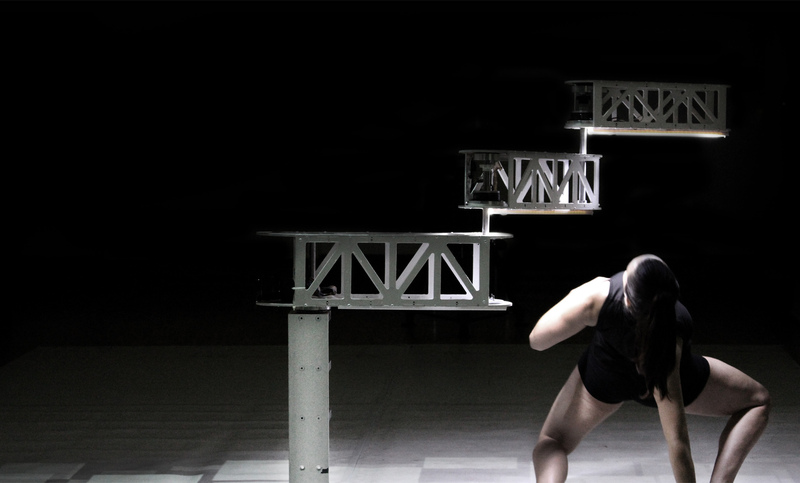 This view point of the piece has effects on both the design of the modules the dancers interact with, as well as the choreography. 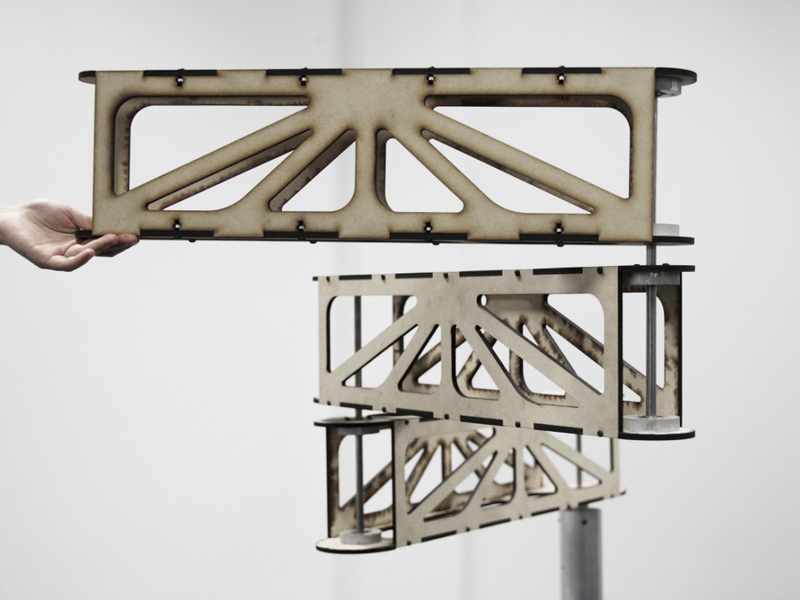 The design for the modules are inspired by the SCARA(Selective Compliance Assembly Robot Arm) robot. 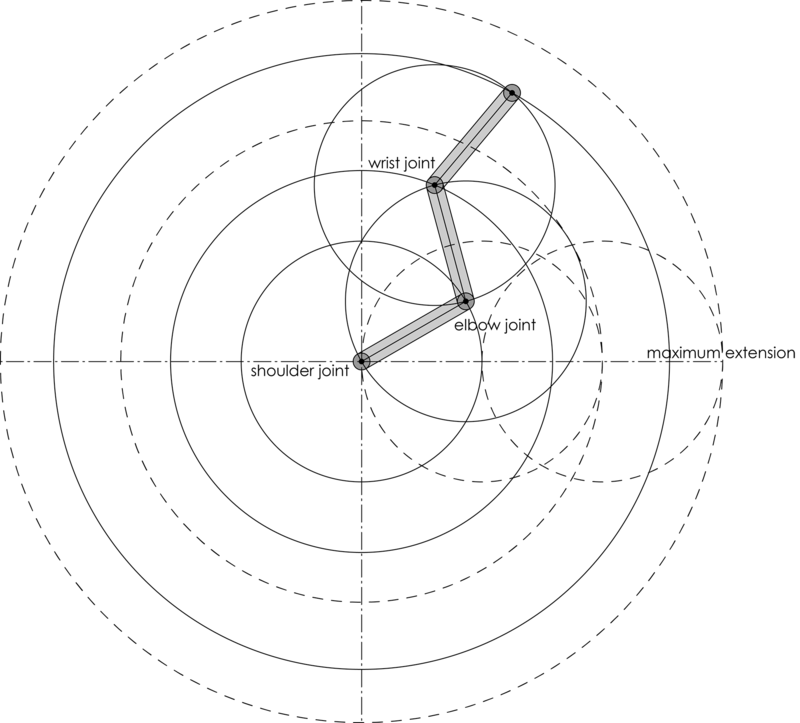 By virtue of the SCARA’s parallel-axis joint layout, the arm is compliant in the X-Y direction but rigid in the ‘Z’ direction, hence the term: Selective Compliant. 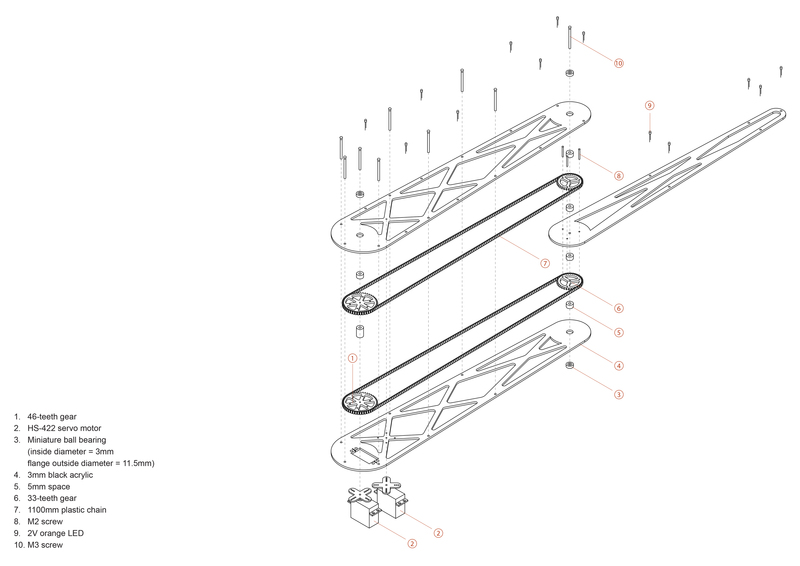 The second attribute of the SCARA is the jointed two-link arm layout similar to our human arms. This feature allows the arm to extend into confined areas and then retract or “fold up” out of the way. Peter William Holden’s work has been a great source of inspiration for this project. His work explores ways of dissolving the boundaries between cinematography and sculpture. His recent investigations of this theme have involved the usage of computers combined with mechanical elements to create mandala like installations. These installations are used to create ephemeral animations. This ephemeral choreography of movement is the focal point of his work. His work can be found here. Landscape Abbreviated by Nova Jiang is a kinetic maze consisting of modular elements with rotating planters, which form a garden that is simultaneously a machine. His work inspired our project by making the experience of space dynamic and unpredictable through simple interventions. 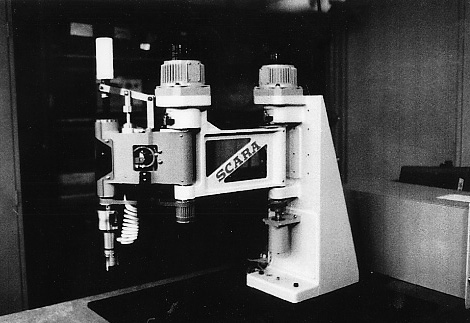 The first prototype explored an adaptation of the SCARA where 2 segments were controlled individually by servo motors. This network was meant to be comprised of 9 modules. Very quickly this prototype taught us that in order for the robot to be compliant, part of it would need to be free moving. At this point we looked at another adaptation of the SCARA is Cycloïd-e by Cod Act. Cycloïd-e is a tubular metal segments pendulum that reproduces sounds through a rotating movement reacting speakers. The perfect equilibrium is determined by the segment’s energetic exchanges; the trajectories are surprisingly natural and harmonic and create a real cinematic choreography. You can read the full description of the project here. 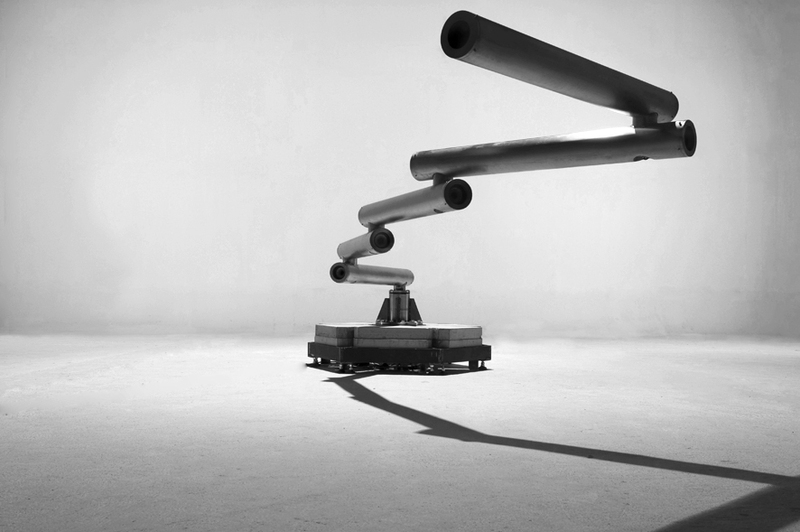 We conducted a set of experiments using 2-4 arms controlled by a single servo attached to the first segment. Learning from these experiments, we decided to build our robot with three segments, which allowed us just the right amount of control alongside unpredictability. This prototype was completely under actuated. It allowed us to understand the scale, strength and limitations of the robot we intend to build. Furthermore, this was the first opportunity for the dancers to interact with the piece and learn its limitations. 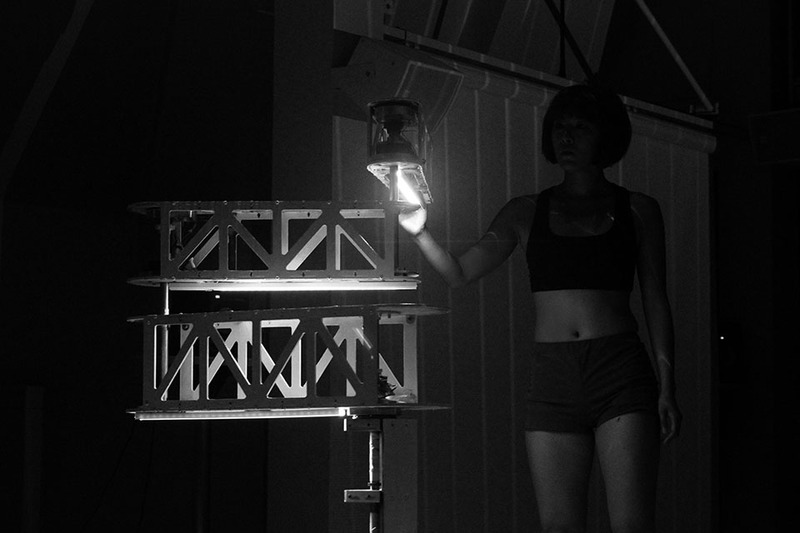 Based on this interaction between the prototype and dancers the final prototype was built for a first performance. The first performance was scheduled for 2nd July, 2015. At this stage prototype 3 was designed with a single stepper motor driving a main shaft which directly controlled the first segment. The second and third segment could rotate freely based on the momentum gained due to the movement of the first arm. Brakes present at their joints allowed for us to control when they are to be stopped in order to form certain positions. 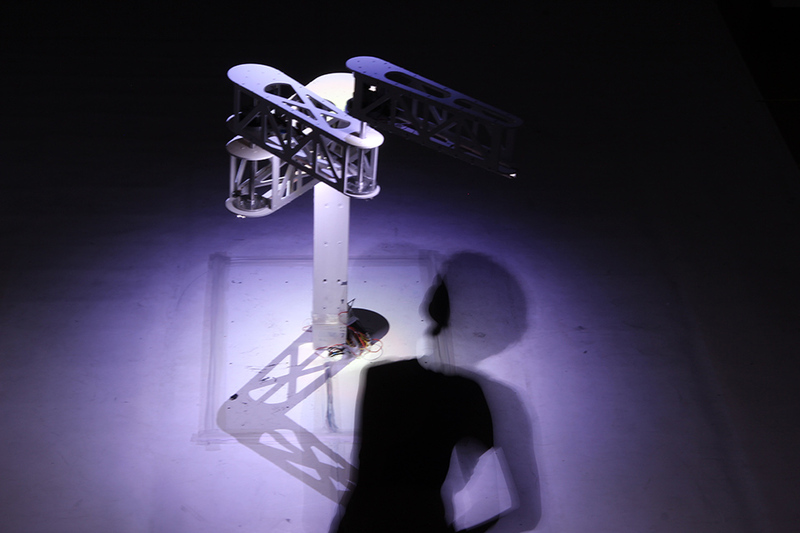 Prototype SCARA robot is able to adaptive to external forces passively when it has physical contact with a dancer. 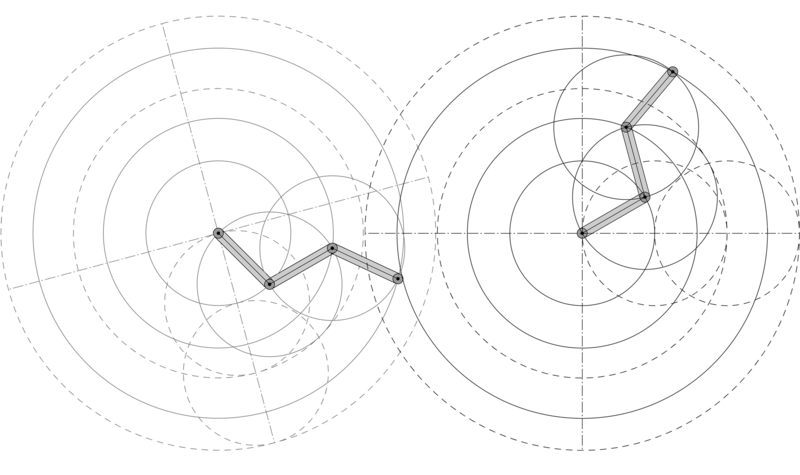 Presently, we envision a network of 2 modules, each with three arms. The central arm will be motor driven, which will in turn passively rotate the second and third arm connected with bearing brakes. The brakes will help control the position at which the arm segments are intended to stop. 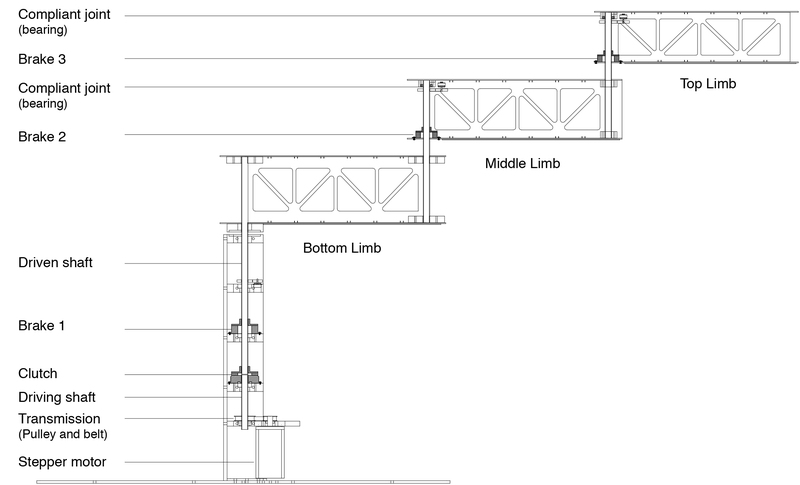 Each of the modules will be at varying heights so that each module can be placed on site with their maximum extents overlapping another modules’. This will allow the modules to enter into the space of the other, thereby creating a combined space, as opposed to individual designated spaces per module. Dancers train for long hours, often repeating movements in order for their muscles to remember the movements they intend to make. This “muscle memory” is extended to Trespass by virtue of the modules which learn the dancers movements, through their interaction, and repeat the movements they learn when the dancer leaves the proximity of the module. The modules will communicate within the network to respond to the presence of dancers within the space, as well as when the dancers interact with a particular module. The modules will be lit to enhance the experience to touch, movement and communication. The intent of Trespass is exploring the emerging possibilities for relationships between human behaviour and intelligent environments – that is to say, the ways in which creative and emotional impulses might be instantly extended to and reflected back by the architecture and structures that surround us. The piece is scheduled to open in 2016.